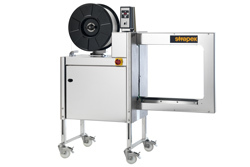 Strapex serves the market with system solutions and services for securing goods for various industries. It offers a complete range of products, from strapping and stretch wrapping machines and tools to consumables and services. Founded in 1955 as a private Swiss-based company, Strapex is today well represented in the market with own sales units and distributors around the world.